The Kents arrive in Washington DC and stop into the United States Capitol Building. Here Lois & Clark teach their wide-eyed son the strength in freedom of speech as they encounter a lively protest. The next visit is the World War II Memorial where Jon's education continues. Lois 'introduces' Jon and Clark to her uncle Kurt Lane and tells them about his history and continued legacy. At the Gettysburg National Military Park Jon is drawn into the historical conflicts that took place there, but is unsure of whether he is imagining the ghosts he encounters. It is a deeply profound journey and when they happen upon the Dowd family in the park they are touched by the family's sad story of the their lost relative who went missing on the journey home to reunite with family after serving his country. The tragic tale touches Superman who makes it his mission to make things right. Story - 5: A Hallmark movie? No, but a rare Superman story. 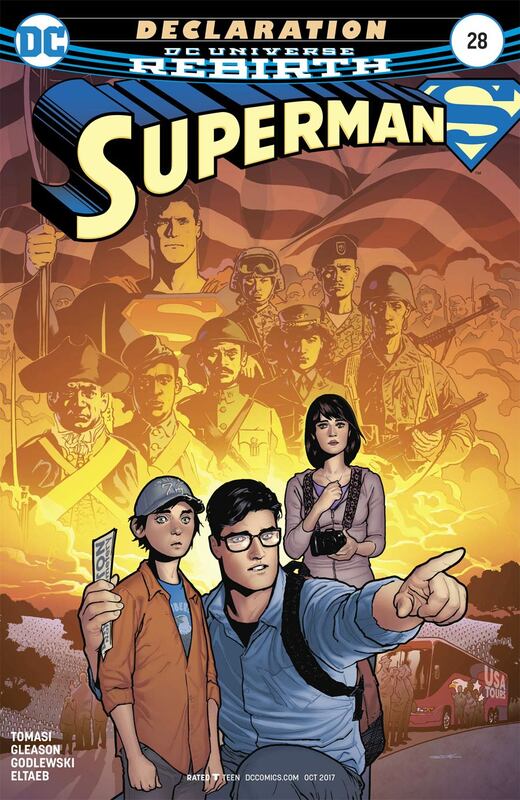 Tomasi & Gleason have crafted a touching, emotional story that reaches into the heart of Americana and puts Jon in touch with his roots, while exploring Lois & Clark's own roots in American history. I still enjoyed the Hamilton Fair issue over this one but this story would thaw even the coldest of hearts. 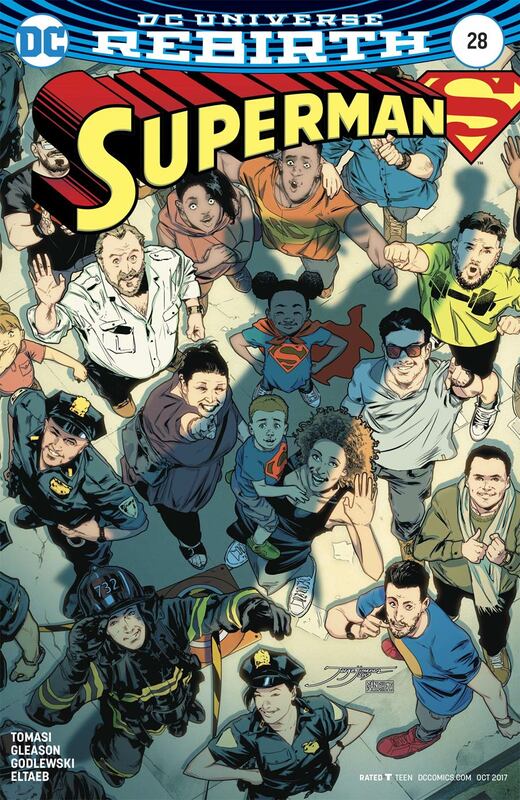 I found this a breath of fresh air and much needed break from the super-heroism, but like last issue I hope Clark gets back into action next issue. A little easter egg is hidden in this issue, can you find it? Art - 4: I'm not a great fan of this style of art and having no action doesn't really help matters in giving it the spotlight. Godlewski does a great job but you still get the sense he is holding back as he has little to do with the visuals. Cover Art - 5: A cover that perfectly encapsulates the journey that The Kent go on culturally and emotionally. Like the interior it has little action to play with, the bus scene or the dive to find the lost soldier could so easily have been the theme that Sook went for. Instead, like the last issue variant, emotion and education are brought to the fore in a beautiful family photo style image (plus ghosts of the past watching over them). Variant Cover Art - 5: This variant is great, nothing to do with the interior story and an image we've seen countless times but taken for granted. It is one of those scenes between the action-packed ones that every iteration of the Man of Steel has enjoyed - you know that 'is it a bird, is it a plane?' moment? It is a great piece that runs on the theme of this road trip and I notice a great many cameos thrown in there too. Thematic covers, I feel, can only work for characters that have been around a long time and are recognized for their actions. The looks on the faces in the crowd speaks volumes.